The Kinect sensor is able to accurately (1 cm at 2 m of distance) measure the depth using a stereo pair composed by an infra-red laser projector and a monochrome sensor. The use of depth imagery simplify the foreground/background segmentation and, with the use of appropriate recognition algorithms, allows to easily track the body joints of multiple users. The Kinect sensor it is therefore extremely useful in the implementation of natural user interfaces. One of the most critical limitation of Kinect based interfaces is the need of persistence in order to interact with virtual objects. Indeed a user must keep her arm still for a not so short span of time while pointing at an object that she wants to interact with. 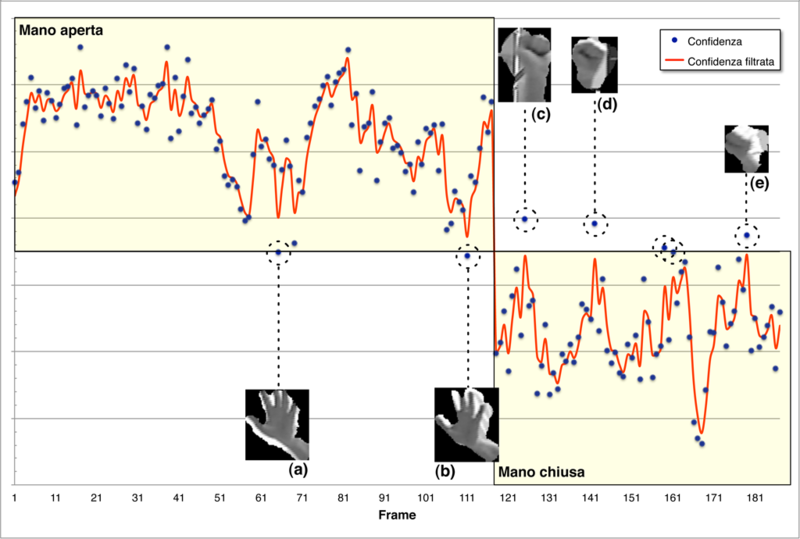 The most natural way to overcome this limitation and improve the interface reactivity is to employ a vision module able to recognize simple hand poses (e.g. open/closed) in order to add a state to the virtual pointer represented by the user hand. In the BSc Thesis project of Lorenzo Usai we exploited the OpenNI library together with the NITE middleware to track the hands of multiple users. 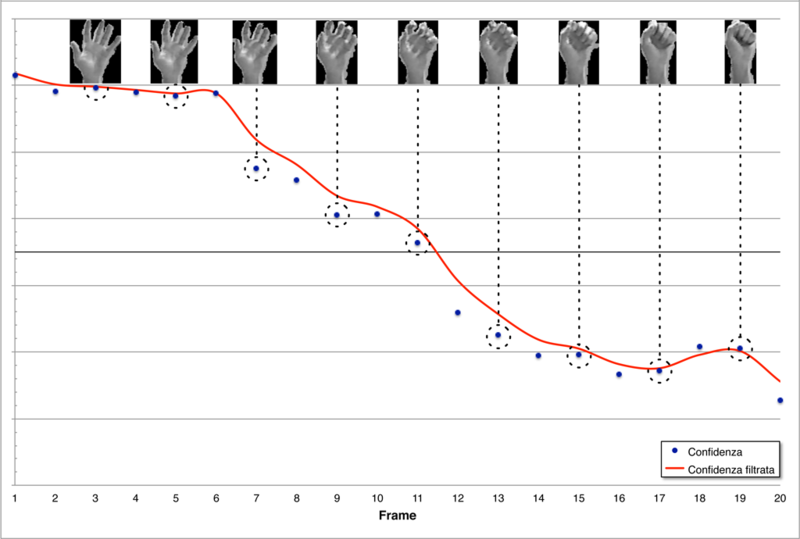 The depth imagery allowed us to obtain a precise segmentation of the user hands. Segmented RGB hand images are normalized with respect to the orientation and a fast descriptor based on an adaptation of SURF features is extracted; we train an SVM classifier with ~31000 images of 8 different subjecs to recognize hand poses (open/close). A Kalman filter is used at the end of our recognition pipeline to smooth the prediction results, removing peaks of rare occasional failures of the hand pose classifier. The resulting recognition systems run at 15 frames per second and has an accuracy of 97.97% (tested on data independent from the training set). Ciao io sono uno studente presso l’Escuela Politécnica del Litoral (Ecuador) e sto sviluppando un progetto con Kinect che in una delle sue parti si basa sul riconoscimento se la mano è aperta o chiusa e quindi eseguire alcune operazioni di elaborazione e contare il numero di volte che ha quindi voluto sapere se hai caricato un po ‘di codice per condividere. ho letto la tesi e l’ho trovata molto interessante. Sono una studentessa di Robotics Engineering all’Università di Genova e sto lavorando anche io ad un progetto con il kinect. Volevo chiedervi, è possibile avere il codice che avete sviluppato o parti di esso?